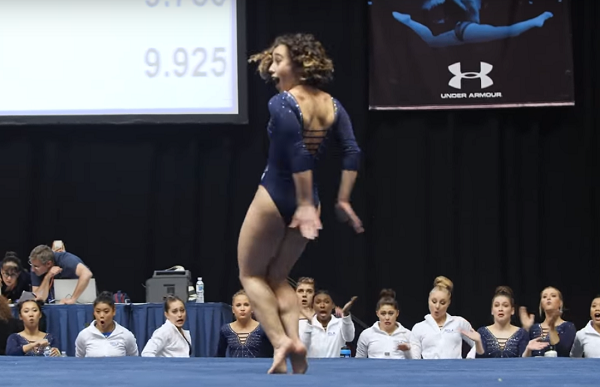 College Gymnast’s Perfect 10 Michael Jackson Routine Goes Viral In Hours. 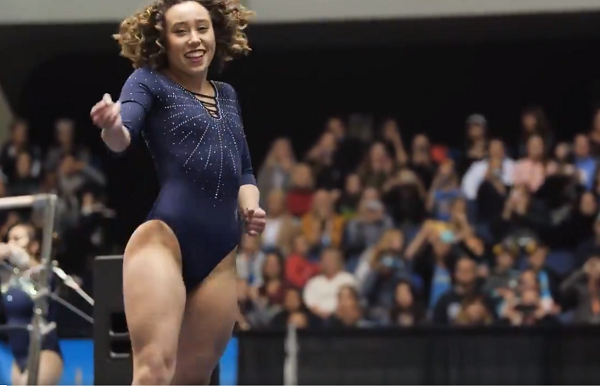 One year after going viral for her incredible Michael Jackson-inspired routine, gymnast Katelyn Ohashi has done it again. You might recall Katelyn as the former Olympic hopeful who currently completes for UCLA. 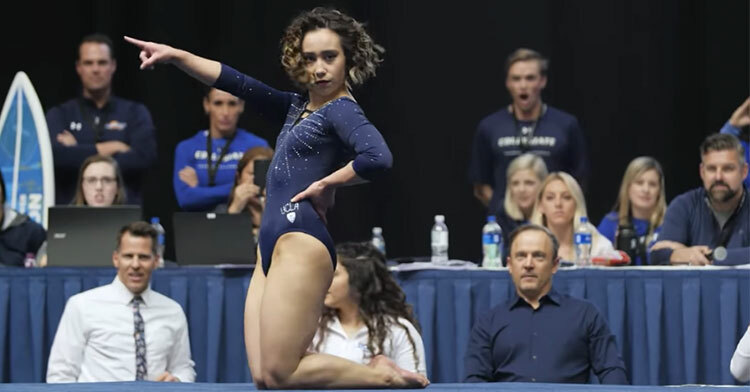 At the 2018 Pac 12 Championships, Katelyn’s energetic and fun dance-meets-gymnastics floor routine earned her a perfect 10 score from the judges while also catapulting the young lady into viral stardom. 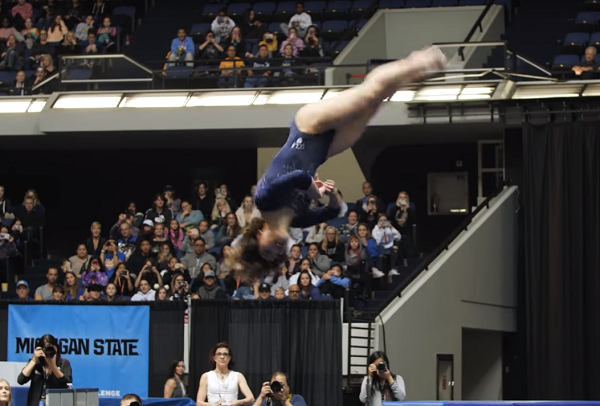 As the 21-year-old college junior took to the floor for the 2019 UCLA gymnastics season opener versus Cal, everyone was wondering if she’d manage to capture the same lightning in a bottle that she had the year before. The moment her routine began, it was clear to everyone watching that this champion was in it to win it yet again. 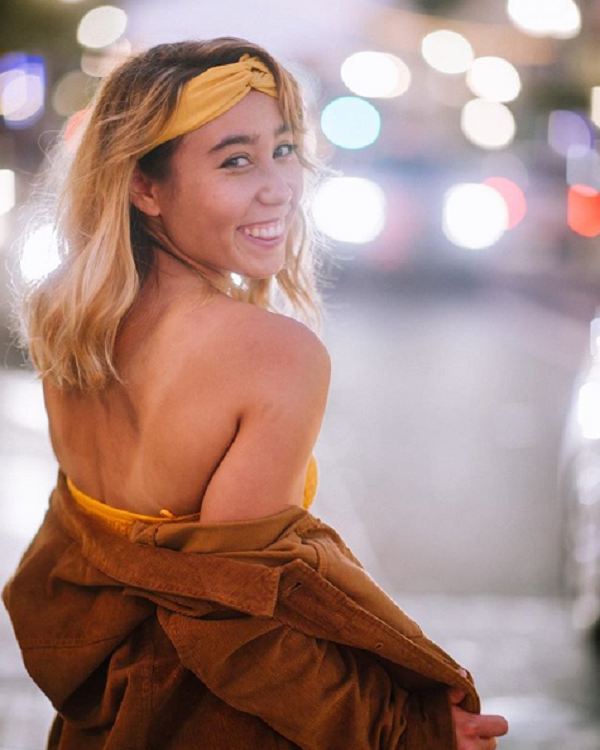 Katelyn once again mined Michael Jackson’s song catalog for her floor routine, and the amazing athleticism mixed with the sheer joy she projects with every movement left the crowd stunned and energized. She not only lands every single movement of her peppy routine, flying through the air and tumbling end over end seemingly effortlessly, but she looks like she’s having a great time while doing so! It’s hard not to smile as you see the huge grin on Katelyn’s face as she performs, and she provides the perfect amount of sass and modern dance moves to compliment the music. You can see her teammates cheering her on from the sidelines, and at times they’re even dancing along with her routine. 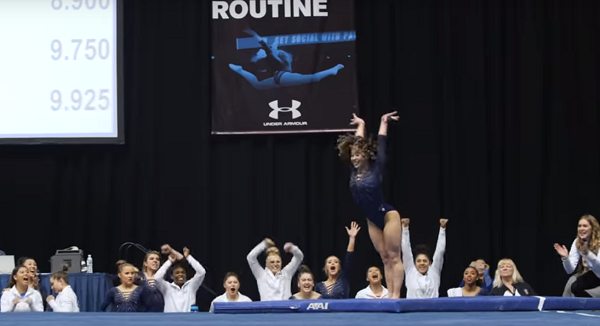 They’ve most likely seen Katelyn practice this routine for months on end, but in the moment of competition, the energy was simply through the roof! 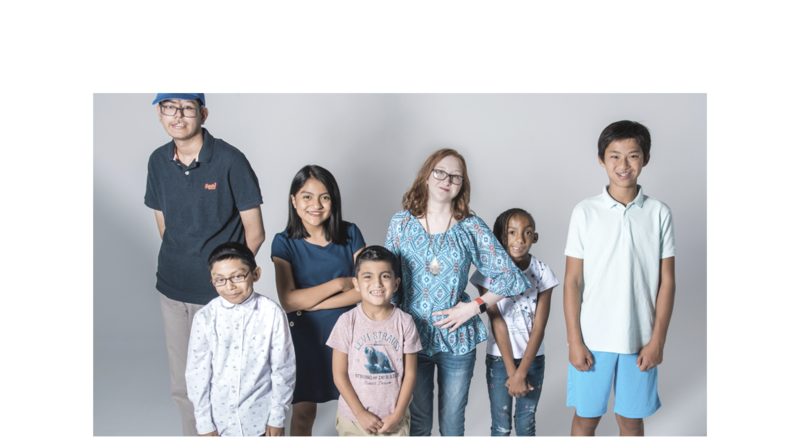 As soon as the event was over UCLA uploaded the video to their social media sites, and within hours the video had already gone viral with over a million views. Katelyn’s success is all the more inspiring because back in 2013, she was competing against (and beating!) gymnastics stars like Simone Biles as she tried to earn a spot on the Olympics team. 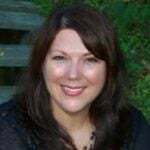 Yet after all of the grueling training and body image issues that plague young athletes, Katelyn was so stressed out that she contemplated quitting the sport altogether. On the verge of quitting, Katelyn’s gymnastic career got back on track once she got to UCLA and met her new coach, Valorie Kondos Field. Katelyn’s happiness was on full display as she vaulted across the floor and flew through the air. Her entire persona vibrates with palpable joy as she nails every movement. Now that we understand how hard she’s worked and how close she came to quitting, her success is even more impressive. We’re certain that Katelyn must be very happy with herself after this stunning perfect 10 performance! Going viral is just the icing on the cake for this incredible student-athlete. Katelyn’s success is proof that with hard work, great coaching, and a fantastic attitude you really can do anything! Watch Katelyn’s amazing Michael Jackson routine below, and don’t forget to share the joy!